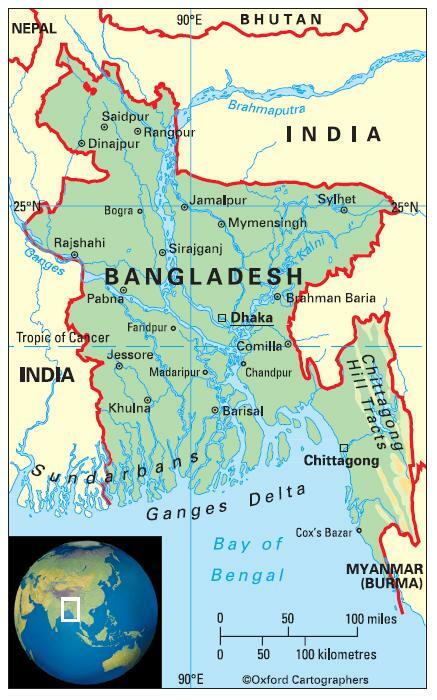 Bangladesh is a huge country in terms of population. It also has its huge challenges like poverty, hunger, malnutrition, illiteracy etc. But we are fighting these adversaries with a vision. Our Hon’ble Prime Minister Sheikh Hasina, declared ‘Vision 2021’ for Bangladesh. A vision to become a knowledge based ICT oriented middle income country, by 2021, where poverty will be drastically reduced, the citizens will be able to meet every basic need and development will be on fast track, with ever-increasing rates of growth. The enrollment in primary level schools is 16.96 million, about 10 million students at secondary and higher secondary levels and more than 500 thousand students study in pre and post graduate levels. Government of Bangladesh adopted and is implementing the Education Policy that reflects the aspirations of our people and the commitment of the government towards a holistic development of our human resource. Bangladesh started the gradual but successful implementation of the Policy and it is regarded as one of the most significant achievements of present government. Government of Bangladesh committed towards Millennium Development Goals (MDG) and Dakar Declaration of Education for All. Even stepping forward to Dakar EFA Goals, present government is committed through its Election Manifesto to enroll all school age children by 2011 and to achieve complete literacy by the year 2014.Bangladesh already almost reached the target of MDG-2 with having 99.34% enrollment in primary education and partially MDG-3 through achieving gender parity at primary and secondary level . Bangladesh has taken due action with regard to improved access to Early Childhood Education and secondary education, expansion of skills development and higher education, qualitative improvement of teachers, ensuring good governance in education administration and gender mainstreaming in line with the Communiqué of 17th Conference of Commonwealth Education Ministers held in Kuala Lumpur in June 2009. Government provides free primary education and provides stipend to about 25 million primary and secondary level students (From class I to class x). Textbooks are being supplied to all primary and secondary level students which is about 232 million books to about 32 million students. Next year we shall have to distribute more than 260 million books for the students free of cost for students. Girl’s education is free up to degree level and stipend is also provided to the poor students of that level. Inclusive education is now at the centre of our educational intervention. To support the poor and brilliant students of secondary and higher education an Education Trust Fund has been established. Every year hundreds of thousand teachers get different types of training. In line with the vision to build ‘digital Bangladesh’, ‘multimedia classrooms’ has been established where laptops, multimedia projectors and internet modems are being supplied—in more than 20 thousand educational institutes. Thousands of teachers have been trained in developing digital teaching learning contents. Emphasizing technical and vocational education and skills development, a Skills Development Policy has been formulated and the technical and vocational education system is gradually aligning with the Policy. Technical and Vocational Education has been introduced at secondary and higher secondary level. Higher education facilities of the public universities are being spread over the entire country, so that students of different regions can receive higher education without going very far from their familiar environment at home. Thus there is at least one public university in all the administrative divisions of the country. At present there are 96 universities in Bangladesh of which 34 are public and 62 are private universities including engineering, agricultural, science and technological, medical and veterinary and animal science. We strongly believe that joint effort, exchange of expertise in addressing common challenges in commonwealth countries could make a significant change towards socio-economic status through human resource development and definitely Bangladesh will be benefitted from that. Mr Nurul Islam Nahid was born on 5th July 1945 in Kasba Village at BeaniBazar Upazilla in Sylhet district. He completed his Primary Education from Kasba Primary School, Secondary Education from BeaniBazar Panchokhando Horgobindo High School and Higher Secondary Education from Sylhet M.C. College. Mr Nahid received his higher education from the University of Dhaka. Mr Nurul Islam Nahid has had a long prosperous political career. He is known to people from all walks of life as an honest, dedicated and sacrificing political leader. As a student of M.C. College Sylhet he started his active struggle against the illegal so called Martial Law in early 60s. He was one of the participants of first procession brought out against Martial Law and performed his role as an active worker and organizer. Later on he took active part in national movement against the autocracy of the then government, calling for education, sovereignty, secularism, democratic and establishment of constitutional rights movement. In 1969’s upheaval based on historic 6 points demands of Bangladesh Awami League and 11 point demand of all party action committee, presented him in the forefront as a prominent student leader and one of the members of all party student action committee. During the liberation war, he established special joint guerrilla force with student union and NAP-CPB student union as a President of great progressive student union at that time. Mr Nahid successfully performed the task of Guerrilla training, collecting arms and assistance form Indian government with its continuation. He conducted the first and foremost international level press conference to inform the genocide done by Pakistanis in the then East Pakistan. On the same issues, he sent letters to all countries students and youth organization including the International Union of Students (IUS) and World Democratic Youth Federation (WFDY) urging for extending support and assistance for the freedom and liberation of Bangladesh. After the establishment of sovereign Bangladesh, the 13th convention of Bangladesh Student Union was held from April 9 to 11 in the year 1972. The convention was chaired by Mr Nurul Islam Nahid. In that meeting father of the nation Bangabandhu Sheilh Mujibur Rahman was the chief guest. Mr Nahid was elected organizing secretary, two times general secretary of Sylhet district student union and at the same time he was elected a member of central student Union. He held the post of organizing secretary, then General secretary of the central student and later on he was elected the president of Bangladesh Student Union in 1970. Mr Nahid was the founder chairperson of Bangladesh Youth Union. He was elected one of the secretaries and the member of the presidium of Communist Party of Bangladesh in 1973 and performed his responsibilities for a long period and general secretary of Communist Party of Bangladesh (CPB) in 1991. In 1994, regarding the changing situation at national and international political arena, he joined Bangladesh Awami League (AL). Mr Nahid was then elected Human Resource and Development Secretary of Bangladesh Awami league central executive committee. Mr Nahid was elected as a member of the parliament in 1996 from Sylhet-6 constituency and at that time he was elected as chairperson of parliamentary standing Committee on Education. Besides, he was elected the member of foreign affairs and government account related Standing committees in the parliament. Mr Nahid was again elected a member of the parliament on 9th National Parliamentary Election held on 29th December, 2008 from Sylhet-6 constituency. The difference of vote with nearest candidate was 87 thousands. Mr Nahid got the responsibility of Minister of the Ministry of Education. He is the chairman of Bangladesh National council for UNESCO. He heads many important committees and Institutions including the first chairman of the language Institute. He is also the first chairman of the Prime Minister Education trust fund. He is the chairman of the Board of governors of the National Academy of Education management (NAEM). At the same time Mr Nahid is working as the secretary of education and human resource development of Bangladesh Awami League. Mr Nurul Islam Nahid is the author of five books which have been written on Politics, Economics, social life, culture, Education etc. In addition he has published more than 200 articles in the national newspaper on political, socio-economic and Education. Under his initiative for the first time a National Education policy was framed and passed in the parliament unanimously which is now under implementation. During the government led by Prime Minister Sheikh Hasina, great changes, reforms and modernization are taking place in the field of education in Bangladesh and Nahid is playing a vital role. As minister he participated in many national and international seminars related to Education. Mr Nahid is well known to lead an honest, dedicated and simple life. In the present government he is considered to be the most successful minister for some obvious successful achievement. He is blessed with two daughters. The elder daughter, Nadia Nandita Islam, is a teacher of Dhaka University; she obtained first class in all examinations including first class first in Bachelor of Arts (Honors) and Masters of Arts. The younger daughter Najia Samantha Islam completed BBA(honors) from Dhaka University and now studying MBA at North South University. His wife K U Johra Jesmin was a senior government official. The public education system in Bangladesh is managed by two ministries: the Ministry of Primary and Mass Education – responsible for primary education and mass literacy – and the Ministry of Education – for secondary, vocational and tertiary education. There are nine boards of intermediate and secondary education responsible for conducting public examinations such as the Secondary School Certificate and the Higher Secondary Certificate. Public spending on education was 2 per cent of GDP in 2008. There are five years of compulsory primary education and eight years of free education, starting at the age of six. Almost all primary schools are government-managed. Secondary schools comprise a first cycle of three years and a second cycle of four years. Some 66 per cent of pupils complete primary school (2009). The school year starts in January. A parallel system of education – madrassa education – offers Islamic instruction from primary level up to postgraduate level. The main public universities are the University of Dhaka (established in 1921); University of Rajshahi (1954); Bangladesh Agricultural University (1961, located in Mymensingh); University of Chittagong (1966); and University of Jahangirnagar (1970, in Savar, Dhaka). There are also several private universities in Dhaka, including North-South University and Independent University. The Bangladesh Open University provides distance learning for a wide range of students at secondary and tertiary levels. The female-male ratio for gross enrolment in tertiary education is 0.70:1 (2011). Literacy among people aged 15-24 is 58.8 per cent (2012).